Floor Scale – PCE Americas, Inc. Floor scales vary in size, with some platforms covering a few square feet and others covering several hundred square feet. This range reflects the many uses of floor scales in the day to day functions of many industries. Livestock, containment drums, heavy machinery and pallets are just a few of the items commonly weighed using these general purpose scales. While portable scales are available for some of these applications, most industrial uses require large scales constructed of rugged and durable materials that are often heavy and not easily moved. In fact, industrial floor scales are often completely integrated into the structures in which they are used. Designed with a low profile for easy loading of items or vehicles, floor scales are utilized in the daily operations of shipping and receiving, medical, agriculture, veterinary, bulk loading, transport, railroad, engineering, automotive, aerospace, retail, hospitality, petrochemical and several other industries. Durable metals such as steel, stainless steel, cast iron and aluminum are used in the construction of these scales in order to promote product longevity and resist corrosion that might otherwise compromise accuracy and stability. Most floor scales have the same basic design, though the actual measuring components vary considerably. The platform is a large broad component, most often made of sheet metal, which rests at or just above floor level. The objects or containers are placed on this plate. Below this are the variable weight or pressure sensing apparatus used. A meter, digital or analog, may be attached to the plate or located in close proximity to show the weight. There are several instruments used to provide the information for these meters, though the use of springs, hydraulics and load cells or strain gauges are the most common. Springs are common only for lighter duty floor scales. These calibrated metal coils have a known consistent resistance. The degree of compression caused by the above load corresponds to a particular weight. Springs may also be used in conjunction with other floor scale apparatus to provide shock absorption during loading. Hydraulics can also provide a buffer against heavy loading and work to measure weight in a manner similar to spring scales. A hydraulic cylinder containing fluid with a known displacement is located below the platform. The amount of displacement correlates to specific weights. 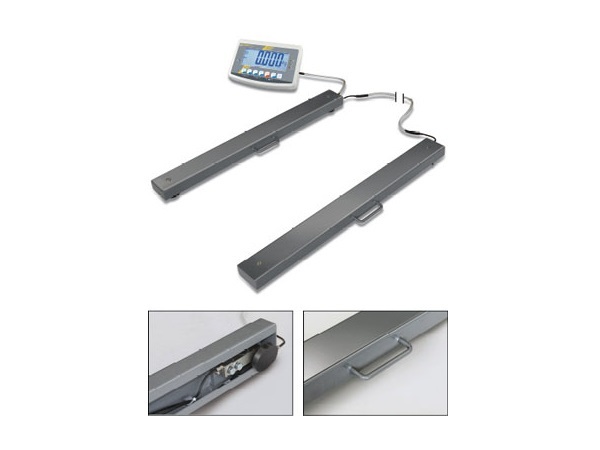 Finally, electronic scales use load cells and strain gauges to report the weight of an item. The degree of deformation of a conductive coil or foil located beneath the plate alters the electrical resistance, which is then converted into electronic signals that display the weight on a digital panel. It is important to consider the capabilities of a floor scale before use in order to avoid mechanical failure due to overloading. 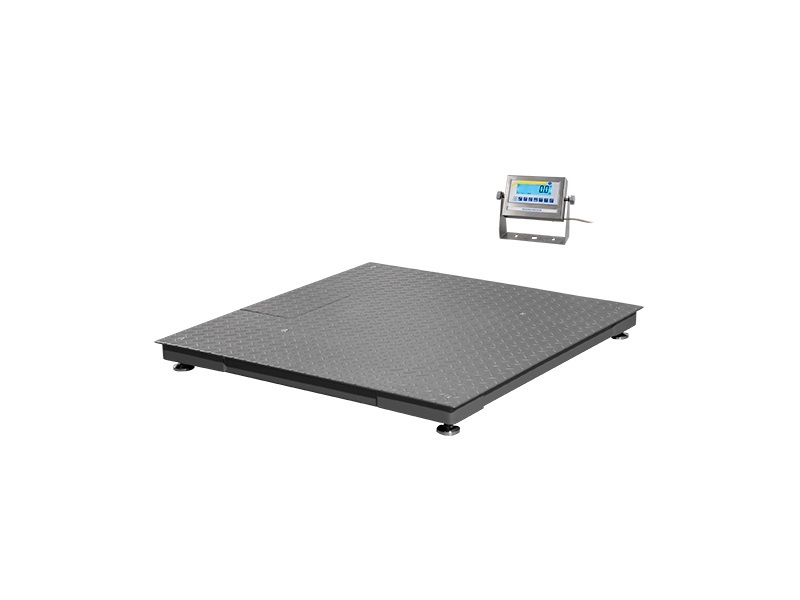 Floor Scales Floor scales are ground-based weighing systems used to measure the weight of objects in a number of industrial, commercial and consumer applications. The most common type of platform scale, these devices can rate loads as light as a few pounds and as heavy as 100,000 pounds.